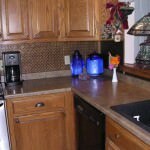 Easy to have a beautiful low-cost kitchen backsplash in a few hours, just plan, measure twice, cut once with regular scissors and glue to most any secure surface. Can cover bar counter top, use as wall panel covering or modernize some furniture. PVC backsplash roll in size 2 feet by 25 feet and available in many designs and colors. DECORATIVE CEILING TILES GLUE UP WITH OVERLAPPING EDGES, NO SEAMS. 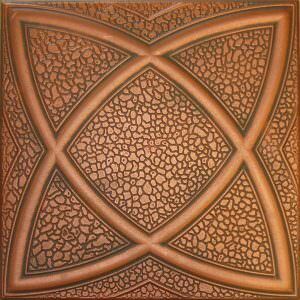 Beautiful Decorative PVC Ceiling Tiles Available In Many Designs & Colors and Combination of Colors. Easy To Install just glue to most any clean secure surface with overlapping edges. In this Installed Picture the Design 117 in Antique Copper color is being glued to old turn of the century slotted board in a hallway ceiling. The Results are Spectacular! Beautiful Kitchen Backsplash with a selection from Real Copper Kitchen Backsplash Panels to Tin Coated Steel Panels. Select from many designs and colors or select the lesser expensive Tin Coated Steel and bring out the artist in you as Tin Coated Steel and must be primed and painted both sides with most any paint that will adhere to metal. 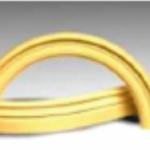 BENDABLE MOLDING IS MADE IN THE USA and we carry a Large Variety of Crown Molding to fit most any requirement. 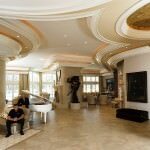 We carry Bendable Crown Molding and unlike our competitors (who carry one bendable material) we provide our bendable moldings in four (4) different material formulations in order to accommodate every application. 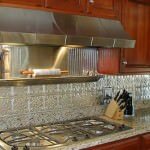 GREAT BENEFITS OF USING OUR BEAUTIFUL DECORATIVE CEILING TILES AND BACKSPLASH IN YOUR NEW OR REMODELING PROJECT. Our Decorative PVC Ceiling Tiles with Overlapping Edges can be glued to almost any smooth clean surface and with Overlapping Edges, the seam is barely visible. 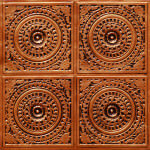 Our Grid Ceiling Tiles are available in 24″ x 24″ and come in 24″ x 48″ grid sizes. Our Styrofoam Ceiling Tiles are easily glued over existing secure popcorn eliminating that Messy Dirty Time Consuming Job of Popcorn Removal. 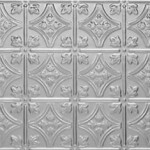 Our Styrofoam or Polyurethane Ceiling Tiles are available in 19.5″ x 19.5″ (500MM x 500MM) or 2.67 Square foot per tile. 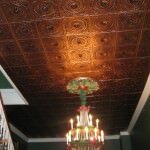 Our Styrofoam Ceiling Tiles are Perfect in Standard White or Paint in any color using water-based paint. 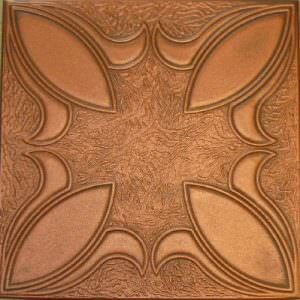 One can achieve the appearance of Antique Copper or Copper for a fraction of the cost of real Copper Metal. Our Rosettes and Medallions are perfect for those ceiling light fixtures. Our Styrofoam Crown Moldings are perfect to cover the edge where the ceiling meets the wall. 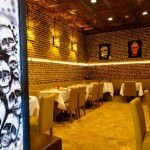 Ceiling Tiles By Us, Inc., Offers Many Beautiful Ceiling Tiles in most any design & most any color, so our Customers are limited only by their imagination. Please browse our Web Site, View Videos, some prepared by Satisfied Customers, see our Testimonial Section where customers have shared their approval of our Products and Customer Service. We encourage viewing our Gallery of many completed projects by our many satisfied customers who were kink to share pictures of their completed projects. Also view our Frequently Asked Questions Page, Product Information, Installation as well as Shipping and Return Policy. any color using water-based paint. a water based paint. This Pattern is a sample indication that the Customer is limited only by their imagination in creating a Beautiful Ceiling. 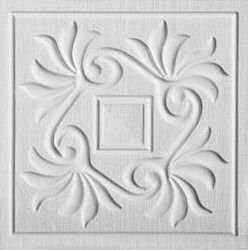 This Ceiling Tile can be used to create a semblance of a Tulip Design making you feel like you are in a Floral Paradise. 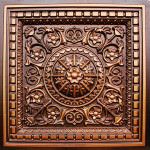 This Ceiling Tile can be used to blend with your Home Decoration. Please note when checking out of our Web Based Store with the selected products in your shopping cart you will have the Payment Options of paying using PayPal and all of the payment methods offered by PayPal and the option to paying using most any payment method you desire. Should you have any questions please contact us. At Ceiling Tiles By Us, Inc., we take Pride in offering our Customers The Most Secure and Confidential Internet Methods of Payment. We accept all forms of Payment Methods and all for you to select your preferred method of Payment for your Order when you enter the Checkout Process.